If you grew up with Star Wars you probably had dreams of becoming a pilot and flying epic space battles. Well now Propel is bringing this dream from a long time ago and a galaxy far away to reality with Star Wars Battle Quad drones. After launching in the UK, Propel’s Star Wars Battle Quad are now officially available in the United States. Retailed for $239 Brookstone and other retailers, you’ll have your choice between a T-65 X-Wing, Tie Advanced X1 (Darth Vader’s personal whip) and 74-Z Speeder Bike picked from the forest moon of Endor. Propel tells us a Millennium Falcon model is in the pipeline but isn’t available yet as the company is still working out the kinks of making what is essentially a pointed frisbee fly right. Each drone isn’t a cheap knock off either. They’re all carefully sculpted with intricate panel lines and details like a high-end collector’s model. That said, Propel had to make some concessions to turn these classic Star Ships into air worthy quadcopters. The X-Wing has a pelican-like gullet to make room for a battery along with two offshoots protruding from the main fuselage to support the two front rotors. Meanwhile, the Speeder Bike is nowhere as sleek as its film adaptation. The Tie Advanced X1 makes the smoothest transition to drone form as the body of the model simply stand on its rotors like four peg legs. On top of taking the shapes of your favorite childhood spaceships, the Battle Quads are a ton of fun to fly around. Able to reach a max speed of 40mph and accelerate from 0 to 35mph in three seconds, these things really zip around quickly. What’s more, these drones firing freaking lasers. You’ll be able to play out dogfights thanks to each drone being equipped with infrared sensors and emitters. Of course, no one just automatically becomes an ace pilot overnight. And so Propel has created a training program within to help drone fliers both young and old slowly ramp up their flying skills. An upcoming smartphone app will include a virtual training simulation that teaches users how the controls work and how to fly the drone. From there, users can switch the drone into a mode that keep the drone level and limits the speed to 10mph until they feel safe to take the training wheels off. At a launch event in New York, we got to play around with the drone in safety mode that was fun, but we can’t wait to really take this thing outside and fly about. The only negative thing we can pick out from these drones so far is you only get 6 to 8 minutes of flight time out of the batteries and fully recharging takes about 30 minutes. The good news two extra batteries are included in the box. Speaking of which, even the collectors box each drone comes in is special. Upon opening the package you’ll be greeted with a light up panel reminiscent of the Death Star interior and a speaker sounding off with the classic Star Wars fanfare. 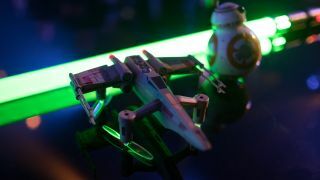 Overall, we think this is the drone Star Wars fans have been waiting for. The Battle Quads are also one of the best drones to pick up for kids if the training modes can really prevent them from crashing the drone immediately.